The man behind Grim Fandango and Psychonauts put up a little Kickstarter project yesterday. 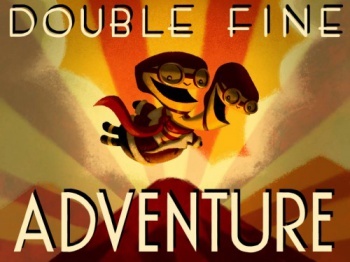 Update Again: As of the exact moment of this update, "Double Fine Adventure" has raised $1,299,836. That's a veritable crapload of cash. Schafer is taking all of this in stride with his signature sense of humor when he Tweeted last night, "$955k! Guys, I'll make you a deal. If we hit $980k I'll add RTS elements to the game! And if we hit $1M, I'll take them back out!" Any time a developer can take the piss out of his own work - Brutal Legend - gets a thumbs up from me. I'm curious to see how high the fundraising total will go. Update: According to Kickstarter, "Double Fine Adventure" is the fastest-funded project in the history of the crowd-sourcing website and with a current total of $726,449 raised, it will undoubtedly reach the echelons of the highest donation total soon. "I can confirm that there's not been a project that has raised as much as this one in such a short timeframe," a Kickstarter spokesperson told Joystiq. The current total of 17,959 backers is a Kickstarter record, however. Are you one of them? Original: Tim Schafer has made some of the most loved adventure games in the last twenty years. From contributing to the Monkey Island series to being lead designer on Full Throttle and Day of the Tentacle, Schafer's time at LucasArts in the 90s would be enough to garner him high praise. Add all that to the list of quirky games the studio he founded, Double Fine, has made (Brutal Legend, Stacking, Costume Quest and Once Upon a Monster to name a few), and Schafer's resume starts to veer into legendary status. Even with all that credibility, the games Double Fine makes still must pass muster from publishers willing to bankroll production. Witness the story of trying to fund Psychonauts 2 and how it might take an angel investor named Notch to make that game possible. Schafer decided to take matters into his own hands, and give it to his loyal fans, by allowing them to fund his next adventure game project through Kickstarter. The "Double Fine Adventure" pledge started yesterday with a goal of $400,000, and in just one night raised more than $500,000 from nearly 13 thousand backers. The project description is short on details, but Schafer wants to go back to his roots to make an old-school adventure game. "Over a six-to-eight month period, a small team under Tim Schafer's supervision will develop Double Fine's next game, a classic point-and-click adventure," the project's Kickstarter page reads. We don't know the idea, concept or plot of the proposed game, but trust in the name of Tim Schafer was apparently enough to raise that much money. Part of the pitch on the Kickstarter page is for us non-game designery folk to get a glimpse of the process behind the scenes of making this game. To that end, the guys who made the Minecraft documentary from 2 Player Productions (also a Kickstarted project) will be filming the making of this adventure game. The release of the documentary will only go to backers of the project, and Schafer promises a more truthful look at what goes in to making a game. "There's an unprecedented opportunity to show the public what game development of this caliber looks like from the inside," the description reads. "Not the sanitized commercials-posing-as-interviews that marketing teams only value for their ability to boost sales, but an honest, in-depth insight into a modern art form that will both entertain and educate gamers and non-gamers alike." The best part about Kickstarter is the tiered rewards your donation gets you. Even if a backer only donates $15 to the Double Fine project, they are entitled to a copy of the game when it is released. In that way, the whole process feels like an extended pre-order instead of just a blind donation. If you're interested in pre-pre-ordering, head over to the Kickstarter page and drop 15 bucks. Even though the goal has already been met, I'm sure Double Fine will make a much better game the more money they have. The pledge ends on March 13th, so you have some time to decide. Donating more gets you more swag like posters, game soundtracks and more. The final tier available on Kickstarter - a $10,000 donation - will treat the donor to a tour of the studio in SF and lunch with Tim Schafer and his colleague on Monkey Island, Ron Gilbert, who is now employed at Double Fine and will probably lend his talents to this new game. Got a spare 150 grand? You will get a piece of gaming history and the envy of thousands of gamers. And you'll be backing what will no doubt be a damn fine game.